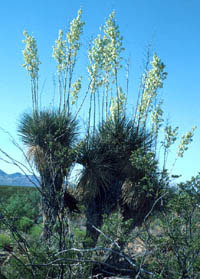 Soaptree Yucca is a tree yucca with a single or multiple stems that reportedly can live for 250 to 300 years. It grows on limestone and igneous soils throughout the Trans-Pecos in west Texas, usually on grasslands and mesas at 4,000 to 4,500 feet. It has thin leaves with filamentous margins and teeth on the undersides. Although most yuccas have fibrous roots that grow from the smooth, rounded knob at that base of the stem, Soaptree Yucca has a taproot and is very difficult to transplant. It gets its name from the "soap" that can be made from the roots and trunk.